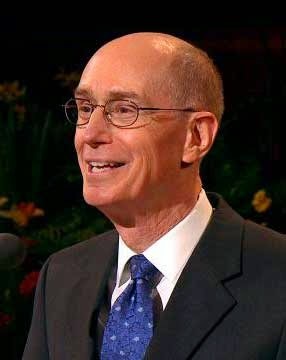 President Henry B. Eyring (1933- ) served in the Presiding Bishopric from 1985-1992, as a Seventy from 1992-1995, then was called to the Quorum of Twelve Apostles. He has served in the First Presidency since 2007. "That is part of the great plan of happiness the Father gave us. He allowed His Son to provide, by His atoning sacrifice, the hope that comforts us no matter how hard the way home to Him may be. "I can know only partially how much He feels joy each time you, as His disciple, help Him bring a moment of peace and joy to a child of our Heavenly Father. "I bear my witness that the Lord has asked each of us, His disciples, to help bear one another’s burdens. We have promised to do it. I bear my testimony that the Lord, through His Atonement and Resurrection, has broken the power of death. I give my witness that the living Christ sends the Holy Ghost, the Comforter, to those we are pledged to help Him comfort." One of the beautiful phrases from the instructions Alma gave to those who in his day were desirous to follow the Gospel plan was that they should "comfort those that stand in need of comfort, and to stand as witnesses of God at all times and in all things, and in all places" (see Mosiah 18:9). In this tender address given to the women of the Church during the recent General Conference, President Eyring expounds upon that charge, encouraging us all to understand and act upon the invitation. Often the best way to provide help and comfort in a time of need is to help bring awareness or remembrance of the reality and power of the Atonement to the one who needs it, truly standing as a witness of Him. 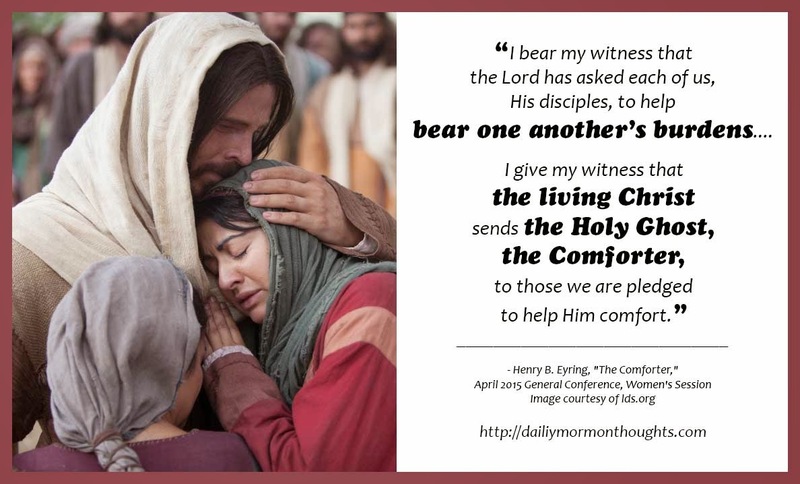 The remarkable part of President Eyring's talk to me is the suggestion that the promise of the help of the Comforter applies not just to the one who is struggling or challenged, but also to the faithful disciple who is their to help bear the burden. As we act as His agents, divine assistance will surely be there.